The use of mobile telecommunications devices for commercial transactions, coined mobile (m-) commerce, has been an emerging trend since the late 1990s. As the phenomenal growth of the Internet and mobile devices has continued unabated, the inevitable convergence of these two streams of technologies has occurred, promising a plethora of mobile data services to the handset user. Although these services have been considerably hyped in the media, and adoption has been somewhat patchy and limited, it does signal the emergence of a range of innovative value added services. With further developments in technology and markets, further services will appear, bringing new revenue streams. One potential area of m-commerce development is in location-based services (LBS). LBS are heralded as the next major class of value added services that mobile network operators can offer their customers. Using a range of network- and handset-based positioning techniques, operators will be able to offer entirely new services and improvements on current ones. Popular examples cited include emergency caller location, people or asset tracking, navigation, location-based information, or geographically sensitive billing. The purpose of this chapter is to examine the technologies, applications and strategic issues associated with the commercialisation of LBS. 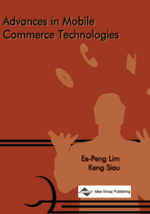 The chapter concludes with some predictions on the role of LBS in m-commerce.